Parkinson’s disease is characterized by the degeneration of nerve cells in the brain, often leading to poor balance, difficulties with walking, muscle pain and rigidity, tremors and involuntary movements, dementia, and memory loss. Fortunately, new gene therapy approaches for treating the root cause of the problem (i.e. neural cell degeneration) are beginning to show some pre-clinical success. These approaches involve introducing genes for neurotrophic factors [i.e. glial derived neurotrophic factor (GDNF)] into well-defined regions of the brain that are affected by neurodegeneration. Once the gene is introduced into the neural cells, the hope is that they will begin to manufacture the neurotrophic protein which, in turn, will halt neural degeneration. However, as currently implemented, there are significant weaknesses to such approaches. Foremost, the genes must be delivered by direct injection through a needle and/or infection-prone indwelling catheters. In addition to being highly invasive procedures, these direct injection approaches are unlikely to yield a homogeneous distribution of the gene in the target region of the brain. Indeed, due to both the fact that human gene therapy is in its genesis and that these current gene delivery procedures are highly invasive, only patients with very advanced disease will be considered candidates for treatment at first. This is unfortunate because, ideally, patients should be treated before significant degeneration occurs. Thus, the ultimate goal is to develop a new and minimally-invasive gene delivery approach for Parkinson’s that would incur minimal risk to the patient and therefore be safe enough to apply to healthy “early-stage” patients who are just beginning to exhibit symptoms. Our proposed approach entails delivering non-viral neurotrophic gene-bearing nanocarriers to specific regions of the brain following their intravenous injection into the bloodstream. To achieve this, two physical barriers to gene delivery must be overcome. The first is the barrier offered by brain tissue itself, the so-called brain-tissue barrier (BTB). Our collaborators at Johns Hopkins University have developed a new technology that allows nanoparticles to diffuse easily through the BTB. These so-called “brain-penetrating nanoparticles” exhibit uniform, long-lasting, and effective delivery. The second barrier to delivery is the blood-brain barrier (BBB), the essentially impenetrable membrane created by brain capillaries that separates the bloodstream from brain tissue. The Price lab at the University of Virginia has been studying how the BBB may be opened in a site selective manner for targeted drug and gene delivery. In essence, they have shown that applying focused ultrasound energy to the brain after the injection of micron-sized gas bubbles (FDA approved for other applications) can open the BBB (Figure 1). Of particular importance to this project, the Price group has demonstrated that opening the BBB with this targeted technology permits the delivery of brain-penetrating nanoparticles (fabricated in the Hanes lab) from the bloodstream to the tissue. The nanoparticles are transported by diffusion and convection to the brain and distribute evenly throughout, yielding homogeneous delivery without an invasive transcranial injection. Advancing this concept to the clinic as a treatment for Parkinson’s disease will require testing the efficacy of the approach in a small animal model of neurodegeneration. Here, we first delivered non-viral reporter gene nanoparticles to rat brain using focused ultrasound, resulting in robust dose-dependent gene expression, only in the region exposed to ultrasound, through day 28. We also measured a transfection efficiency (i.e. the percentage of cells expressing the delivered gene) at > 40%. Toxicity was not evident. We then tested whether the approach had therapeutic potential for treating Parkinson’s disease by delivering neurotrophic (GDNF) gene nanoparticles to the striatum of Parkinson’s rats. 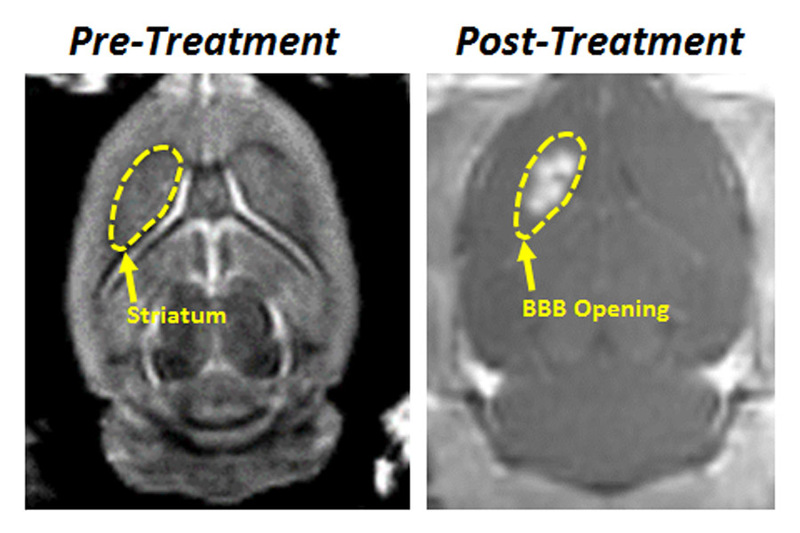 MR images of BBB opening with focused ultrasound in the striatum are shown in Figure 2. For treated rats, motor impairment tests (apomorphine-induced rotation and cylinder) revealed significant improvement and dopaminergic neuron density was fully restored in key brain structures (i.e. striatum and substantia nigra pars compacta). We conclude that image-guided nanoparticle delivery with focused ultrasound is a safe and non-invasive strategy for brain transfection that has potential to be translated into a non-invasive clinical treatment for Parkinson’s disease. 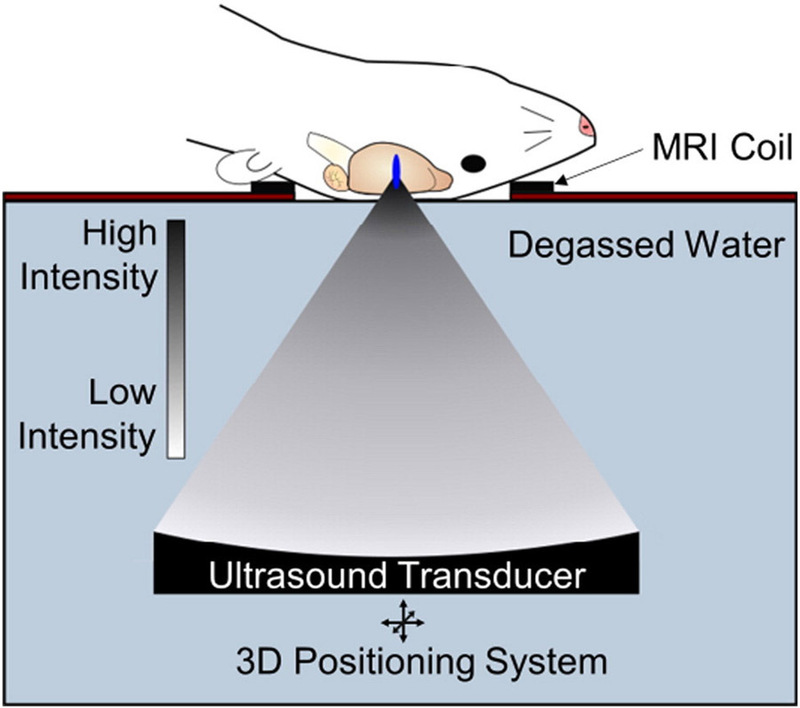 Figure 1.Transcranial focused ultrasound achieves non-invasive, safe, repeated and targeted blood-brain barrier disruption, leading to improved drug or gene delivery. Figure 2. Left: MR image showing structure of the striatum (outlined in yellow), which is the brain region targeted for treatment. Right: MR image of the striatum after treatment with focused ultrasound. The 4 bright spots show where the BBB has been opened in the striatum, allowing for the delivery of gene nanoparticles.